The Church of St. Luke is a Roman Catholic parish of the Diocese of San Diego. We are located in the Rancho San Diego community located in East County and have approximately 1,100 registered families. 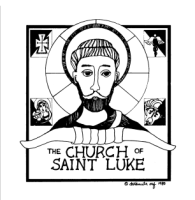 St. Luke was established as a parish in the Diocese of San Diego along with six other new parishes by Bishop Leo T. Maher on July 12, 1985. Rev. Raymond G. (Jerry) O’Donnell was appointed pastor and given the responsibility of building the community called the Church of St. Luke. Our first weekend Masses were celebrated at St. Peter Chaldean Catholic Church on November 2nd and 3rd, 1985 and daily Masses were celebrated earlier in Fr. Jerry’s home. Sunday Masses continued to be celebrated at St. Peter's for eight years or in the wrestling gym of Valhalla High School for seven years. Faith Formation programs began in Summer 1986 in the home of Margie Clark with Scripture Safari; then in the homes other parishioners, or at Fr. Jerry's house on Lola Lane until our first facilities were constructed in 1994. This consisted of the Church, the Hall and a room for parish offices which would eventually become the Youth Room. The first Mass was celebrated in the new facilities on Palm Sunday March 7, 1994 and the church was officially dedicated by Bishop Brom on July 26, 1994. Prior to construction of the Learning Resource Center in which the Parish Offices are now located, Fr. Jerry's home on Lola Lane served as office space for the new church. The house in the next plot over from the church above Hosanna Height was used for the Parish Office's after Fr. Jerry moved into the rectory near the Singing Hills Golf Course. Before the use of the house on top of the hill for offices, a small office space was rented in the Rancho San Diego Town Center next to what is now known as Tabu Sushi where daily Mass was also held. To identify new parishioners Fr. Jerry was given a map with the parish boundaries. Mailouts were sent to homes within the boundaries to pass the word saying that a new congregation was beginning to form. The founding families include the Heibing, Papenhousen, Hodges, Taft, McColl, Pitard, Blanco, Oliver, and many others that came together to build the community we call today, Church. A variety of groups and outreach ministries began shortly after the parish was founded. Groups such as the Knights of Columbus started by Bill Paupenhausen and Las Madrinas which is group of women who wanted to help Fr. Jerry with acts of holiness that he hated to be enacted in the community. St. Vincent de Paul is part of a larger organization to help the homeless, our connection as started by Pat Riggs who had an urge to help those in need. Friends of the Poor began with Carmiña Morfin who started this ministry to deliver items to the poor and needy in Mexico. Altar Servers started with Robert Toy and a group of youth in the St. Luke community who assist the presider during the mass. Our connection to Mamma’s Kitchen which delivers food to those connected to people with AIDS. Don & Shirley Androlewicz started the connection to this organization because their son died of AIDS, which was kept secret at the time, wanted to make a difference in the lives of others. The Church of St. Luke Outreach Committee was always a ministry devoted to help others and became more prominent after Hurricane Katrina when the church adopt a family. The adopt a family program was born out of needs in community committee. The ministry was founded so that the ministry will always be around and looks to Fr. Ron for guidance. Dcn. John Snyder was ordained and began serving the parish as a deacon in 1991. People like to tell the story of how he personally challenged parishioners to step up to the plate and donate for construction of office and classroom facilities during one of the Masses. The parish raised $???,??? in a ? month period and construction began. These buildings were finished and were put into use in 2003. Prior to that, Faith Formation classes were conducted in the parish Hall which was divided into four quadrants on a weekly basis. Dcn. Dennie Nickell was ordained and started serving as a deacon at St. Luke in 2001. At about the same time, Dcn. John moved to his home parish in Alpine. Dcn Allan Williams was ordained in 2011 and Dcn. Gerald (Jerry) Stenovec was ordained in 2013. In 2006, Rev. Ronald E. Cochran (Fr. Ron) was assigned as pastor of St. Luke. During his tenure he has had the pleasure of dining with each member of the parish, which is a testament to love the parishioners of St. Luke have for food and drink. In 2009 we started a Whole Community, Inter-generational Faith Formation program we call Emmaus. In the Emmaus program we gather, once a month, as a whole community of disciples; single adults, couples, families with children, teens, etc. Our goal is to raise the level of knowledge of the faith in our entire community and help our families be domestic church where the Lord is encountered on daily basis. At the same time as starting the Emmaus program, we started Scripture Club for our K through 5th grade children and Life’s Questions-Scripture’s Answers for our Middle School aged youth. Our High School aged youth do reflections on the weekly Mass Scriptures at their sessions. Our goal has been to make religious education less school-like and more Church-like to avoid our young people feeling like they will be graduating from it. We want to emphasize relationship with the Lord and began, in 2013, replacing the lower level programs with a program called Catechesis of the Good Shepherd. It is based on the techniques of Maria Montessori and has proven successful in parishes around the world. Our community has grown and changed over the years but continues to be known, as it has been since the beginning, as a welcoming community. The founding families of the parish have a strong bond with each other because of the work they put into making the parish what it is today. That bond has not kept them from welcoming new families who constantly comment about how the original families have made them feel at home. We are proud to be a parish which embraces each other, no matter what our backgrounds, as we move forward making the Kingdom of God present in Rancho San Diego.